The labyrinthian entry to the Orvieto Underground cave tour. Cities–like people–have a face they show the world and a hidden, intimate side, where the scars of time and trials are revealed to those who have the patience and sensitivity to look past the surface and discover all the fascinating complexity beneath. In Orvieto, this metaphor comes to life in a poignantly literal way. This stately town—proud of its outstanding Cathedral, crisp Orvieto Classico wine, and general cosmopolitan vibe—dominates the surrounding undulating countryside from atop the dramatic volcanic stone outcropping it has inhabited on and off since the time of the Etruscans. But to really get a feel for Orvieto and its millenia-long history, more than wander its streets and piazze you need to head underground to visit its caves—more than 1,200 of which honeycomb the cliff below the historic center. Almost all of these man-made underground caverns and passageways are private property and not open to the public, but the Orvieto Underground tour takes small groups to visit the two which are owned by the city. I had been hearing about this subterranean tour for years and had been curious to check it out, being especially partial to exploring the quirky side of Umbria and unearthing offbeat museums and tours like these. And Orvieto Underground didn’t disappoint. One of the largest caverns has been used over the centuries as an olive oil mill. During the hour-long visit, we saw the very first underground tunnelings by the Etruscans in search of water roughly seven centuries before Christ. The precisely cut rectangular wells (with incorporated hand and foot-holds for climbing in and out) and peaked cavern ceilings resembling rooftops (probably remnants of pagan temples) are testimony to the engineering skill and aesthetic sensibility of this still somewhat mysterious people. After defeating the Etruscans, the Romans sacked the town and Velzna—as the Etruscans called their city–was abandoned until the early middle ages, when the next signs of human life appear underground, as well. As Orvieto began to rebuild at the strategic top of the cliff, its citizens once again found themselved digging out the soft rock beneath their homes in search of water, temperature-controlled storage (the caves maintain an average 12-13° C), and—most picturesquely—pigeon cotes. The walls of these square rooms are pocked by orderly, square pigeon holes and have a small window for the birds to fly in and out during the day. Thus began a tradition of roast pigeon in Orvieto, which you will still find on most menus today. The pigeons raised in these cotes kept Orvieto fed for centuries. In the late middle-ages, as the city began to stabilize and prosper, these underground caverns were expanded and converted to also house workshops for the local ceramic production (cooling cisterns and the remains of a kiln can still be found) and quarries to excavate the soft stone to mix as cement (which continued into the early 20th century). One of the biggest caverns was most recently used as an olive oil press, and the massive millstones and presses still on view make it easy to imagine the room crowded with pickers and workers pressing out one of Umbria’s most prized product each fall. The final cavern of the tour was used as a WWII bomb shelter. The final cavern of the tour brings visitors to modern Italy, as the bare room ringed with a low bench hewed from the stone was used as a bomb shelter during WWII. Orvieto proper was declared an Open City, thus spared from the most destructive raids, but the valley below was crisscrossed with rail- and road-ways and often the target of both the Allies and retreating Germans. I can’t fathom what it must have been like to sit for hours in the blackness of a cave meters below the ground, hearing the muffled sounds of explosions and the quiet rattle of tiny stones dislodging from the ceiling and walls…hoping desperately that the rock would hold. Though the digging of further tunnels under modern Orvieto has been banned for years, almost all the palazzi in the center of town still use their private, undergound caverns–in most cases as a cantina—left for them by centuries—if not millenia—of previous inhabitants. Walking through Orvieto now, I know that the facades lining the streets are just the town’s game face…the true soul of the town lies in its secret labyrinth below. A view over the surrounding countryside from the Orvieto Underground caves. There was a family who lived down the block from me when I was growing up that had a passel of kids. I don’t recall how many, but definitely in the low double-digits. We would play together, and they were always just slightly unkempt…mismatched socks, hair needing a trim, ratty toys. The predictable signs of harried parents short on time and money. That said, I also remember how loved those kids were. Despite there being so many of them, I never got the sense that they were any less treasured than those of us with just a sibling or two who always had clean pants and extra milk money in our pockets. This is kind of how it is with art in Italy. There’s just so damn much of it here that there aren’t the time and resources to take painstaking care of it all. That said, you do get a sense that Italy loves its treasures—despite much-discussed cases of mismanagement and graft—no less than any other country, even if it presents them with much less pomp and circumstance. The lovely sanctuary of the Madonna delle Lacrime right outside of the center of Trevi is a perfect example of this. I stopped by mostly by chance, drawn to the pretty 15<sup>th</sup> century facade and elaborately carved Renaissance portal (by Giovanni di Giampietro di Venezia, I later learned) looming over the winding road which leads from the valley below Trevi up through the sprawling olive groves which surround it. I stepped into the silent church, its lone visitor, and quickly skimmed the historical information near the door, recounting how the sanctuary had been constructed on the spot where, in 1485, an image of the Virgin (now forming the altarpiece) miraculously shed tears. A detail from the elaborate stonework decorating the facade. As I circled the church to take a look at the chapels and artwork, my echoing footsteps suddenly stopped in front of a large Adoration of the Magi fresco. Wait one darn minute. Could that really be? Right here, in this empty church in the middle of an olive grove with not even a caretaker keeping a watchful eye?!? Yep, it was a magnificent Perugino, painted in 1521 and unmistakeable in its fairytale colors, Umbrian landscape background, and—most movingly—breathtakingly fine portraits. I stood for a minute in silent admiration until I was startled by the door of the church banging shut behind me. A slight woman in her eighties, weighed down by a number of shopping bags and a lethal-looking black handbag quickly shuffled past me, set down her load, and kneeled in front of the Perugino. I backed quietly away, leaving this priceless treasure to those who love it best. I love this silly picture of the Virgin’s foot. It’s rendered so haphazardly one just has to wonder if it was quitting time. I happen to think that Umbria is a great destination for kids, for a number of reasons. And Assisi is a fun town for families to visit, with the help of a few caveats to keep in mind and pointers to guide your way. There’s some bad news: Assisi (like almost all of Umbria’s towns) is a hill town. Which means there’s a bit of climbing to get between virtually any two points on your map…which can be trying for kids who are not great walkers, but definitely a chore for everyone on the hottest days of the summer. Try to time your visit according to the season (avoiding long, steep stretches during the hottest hours of the day) and rally your flagging troops with promises of snacks and play time (suggestions for both below). Also, everyone should wear comfortable clothes and shoes (Folks, can we not tour our children around all day in beach flip flops or crocs?) that are also suitable for visiting the Basilica, if that’s on the itinerary. Assisi is, strangely, largely open to traffic (aside from a number warrens of tiny picturesque alleyways, too narrow to fit cars through), so you’ll have to keep sharp for passing cars along most of the main streets. Even the central Piazza del Comune is criss-crossed by cars through the day, so for better (and greener) play places, see below. 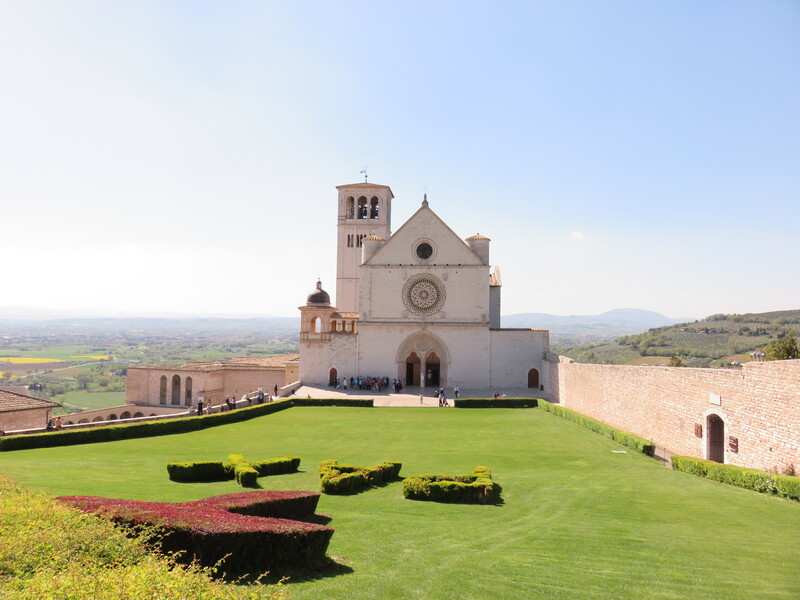 A bit of preparation will go a long way toward helping your kids get the most out of a visit to Assisi, including–most importantly–a quick lesson on the life and person of Saint Francis. His compelling story (Involving some of Disney’s key plot points: spoiled, war-mongering offspring rebels against family to chart own destiny. Personal growth and historical greatness ensue.) is one that most kids find fascinating, and his love of animals, message of peace, and lack of a gory martyrdom make him a relatively innocuous and universal role model. There are a number of excellent biographies of Saint Francis geared toward children (Including one authored by Robert F. Kennedy, Jr. Yeah, that one. ), and parents can choose one which emphasizes different aspects of his life (the religious, the natural, the peaceful) depending upon their interests and tastes. There is also a fun app called Gumshoe Tours Assisi specifically for kids visiting Assisi. Full of games like I Spy, treasure hunts, and puzzles, the app gets kids interested in some of the town’s most famous monuments by integrating games and learning. Definitely worth downloading (the download is free, but there are in-app fees to unlock…see comments below). Also, take a look at my Assisi itineraries (one, two, and three day) for a good general overview, tips like water fountains and shady spots, and more places to eat and shop. The Giotto frescoes in the Basilica’s upper church work exactly like religious art was supposed to back in the day: telling a story in comic book form to an overwhelmingly illiterate congregation. If your kids have had an introduction to Francis’ life (you ordered a book, right? ), they’ll enjoy recognizing many of the most salient events retold in the famous frescoed panels. Also, be aware that the friars are insistent about maintaining silence within the church, so it’s preferable to go over the fresco cycle before entering (using a guide book or app) rather than incur the wrath of the prowling brothers by hissing explanations inside the church. This intact Roman temple facade in Assisi’s main Piazza del Comune is sure to interest older kids who have started studying Roman history (or younger ones who have watched Tom and Jerry cartoons). Not much to see on the inside, but the Corinthian columns and covered portico are a great backdrop for family photos. Flying buttresses!! What more need be said? Also, two fountains (one to the side of the church under the buttresses), a sprawling piazza with no cars (except around the local elementary school 1:00 p.m. pick up time), and a row of shady benches overlooking the valley. This is a good stop to make. This is the de facto playground for much of Assisi’s youth (residents get in for free), as its real stone towers, tunnels, ramparts, and parapets are a million times more fun than any tire-and-timber castle at the neighborhood park. Kids need to be careful of the worn stone steps that can be slippery, and the dark tunnel running under the length of the outer wall to the far tower can either be electrifying or terrifying, depending. But, all told, this is a great place for kids to take a break from the solemn church atmosphere and run off some steam. Also, there’s a grassy outer courtyard with a small refreshment stand (there’s no admission to the outer courtyard) where everyone can get a cold drink and relax for a bit. This Medieval hermitage halfway up the side of Mount Subasio is a good mix of culture and nature for everyone. The pretty stone monastery has a quirky, windy route through its chapel, rooms, and passages and the tiny doorways and stone slabs where the friars slept are a fascinating look at both how small folks were back then and how humbly the first Franciscans lived. On the far side of the monastery, the woods have a number of paths and trails through the surrounding area leading to little shrines and caves where Francis and his brothers would retreat to pray. A warning: these woods are a pilgrimage destination and visitors are expected to be quiet and respectful…so if you are looking for a place for a loud family game of hide-and-seek, this is not it. This is the perfect place for a little break after touring the Basilica. Literally steps from the entrance to the upper church, the Bosco di San Francesco is a recently reclaimed woodland with a gorgeous trail downhill to the valley floor at the bottom. Wherein lies the only problem: if you walk all the way down (it’s a couple of kilometers), you have to make the trek back up. That said, there is a bubbling brook flanked by a pretty (and flat) trail, occasional benches, and lots of woods for exploring at the bottom. A good compromise is simply starting there (there is a free parking lot at the bottom visitor’s center), and exploring the flat bit at the bottom and a bit of trail uphill. This is fun because it’s a church in a church. The grandiose Basilica di Santa Maria degli Angeli hides the tiny Porziuncola chapel inside, which was the center of Francis’ second community of friars (the first is about 2 kilometers away in Rivotorto, where another grandiose church contains a tiny stone hut where Francis once lived and prayed). Assisi is sadly bereft of great playgrounds. In years past, kids would play ball in the church piazzas, but they have been gradually paved over and declared off-limits for play over the past generation. There is a rather desolate, tiny play area with swings and a climbing structure outside the Porta Nuova city gate, which is okay in a pinch. Otherwise, the town park (called Regina Margherita on maps, but known to everyone locally as the Pincio) has just had a grand reopening after decades of neglect and abandon. There are no play structures, but the park itself is very green and pretty and a great place to run around or picnic. Otherwise, the Bosco di San Francesco (see above) is good for running around (if you don’t pass through the bottom visitor center but instead cross the road and take the trail along the stream you won’t need to pay the entrance donation), the Rocca is perfect for the more adventurous (the outer courtyard is open to the public; to enter the castle itself you need to purchase a ticket), or, for calmer kids, the Eremo is good for stretching the legs in shady woods. Of course, the mother of all outdoor play is on the top of Mount Subasio, where the vast grassy plain offers kilometers of traffic-free running around. I can’t talk up the kids’ t-shirts Alice hand-paints enough…sunflowers, doggies, dinosaurs, poppies, whimsical scenes of Assisi. If you give her a couple of days (and she’s not too busy), she’ll even personalize the back with your choice of name painted in a rainbow of colors. A one-of-a-kind gift. Aside from her handpainted tshirts, Alice has jewelry, photo albums, paintings and prints. All in her lovely, whimsical style. This shop is bursting with wooden toys and decorations…Pinocchio in all sizes and colors, mobiles, wall clocks, rocking horses. Toys from another era yet somehow ageless. Ok, yes. In a perfect world, we would feed our children three square meals and two healthy snacks a day, travel or no travel. Yeah, well. Guess what. This ain’t a perfect world. Here’s where you can score some pizza and ice cream. This popular local favorite for pizza on Via Scallette, 10 is usually hopping with those looking for a simple meal at a fair price. They serve pasta and meat as well. The tiny pizza shop “Da Andrea” on the corner right across the street from the Church of San Rufino (there is a small wooden bench next to the door) has the best slices in Assisi. There is, sadly, no great ice cream in Assisi. But there is convenient ice cream…i.e. Caffè San Francesco. After your visit to the Basilica, it’s time to give your brain and feet a rest at this landmark local cafè across the street. Try to grab the secret hidden table behind all the flowerpots on the corner for the best view in town, or enjoy the old-world style marble and scarlet decor inside. Bar Pasticcieria Sensi is about halfway down Corso Mazzini between the main piazza and Santa Chiara. Though not as showy as many other pastry shops around town, this is where the locals all flock to satisfy their sweet-tooth. They also have not great (but convenient) ice cream. Easter comes exceptionally late in 2014, which means it’s a great year to take off for the week and head to Umbria where spring is in full swing. If you are planning an Easter visit, I wrote a few tips about what to expect regarding events and food related to this important holiday for About.com’s GoItaly this week. Want more information on what to pig out on during your Easter break in Umbria? Say no more. What’s the funnest part of Easter in Umbria? Read on. Have any more tips for visiting Umbria at Eastertime? Leave a comment below! Umbria is surprisingly dense with masterpieces of art and architecture, given its small size and relatively modest history (no Medici art patronage during the Renaissance here, as Umbria was part of the vast and stoic Papal State until the 1800s). It’s easy to spend a week or two criss-crossing this region taking in the churches, abbeys, monasteries, and civic museums without ever having to cross her borders to fill your days. You can easily combine your day trip with a drive through the gorgeous Sibilline National Park, or a few hours at the beach along Le Marche’s Adriatic coast. But be sure to make it back to Umbria…we don’t want you to become too enthusiastic about our friendly neighbors! The rock star popularity of newly-minted Pope Francis (in March of 2013) has led to a surge in interest in his namesakes’ life and an explosion in the number of visitors to Franciscan sites in Assisi–primarily the Basilica of Saint Francis–and across Umbria. Though I love the Basilica for its sheer artistic and architectural heft, there are a number of sites scattered around Umbria where Francis lived and prayed that have the quieter, more contemplative vibe that marked the saint’s approach to spirituality and nature. Whether you are drawn to the historical or the spiritual aspects of Francis’ life, there are a number of Franciscan sites which are both fascinating and poignant monuments to this Umbrian saint’s life and work. Take a look at my two articles below for an overview of Assisi’s Basilica and a Franciscan itinerary across Umbria. Pax et bonum. It may look like I’ve abandoned you all, whiling away my days on the divan whilst imbibing on wine and chocolates. Oh, yee of little faith. I’ve been here this whole time, just not here here. I’ve been doing a bit of writing about Umbria and Italy for a number of other travel publications and sites, and as some of these articles may be of interest to folks planning a stay in Umbria or at Brigolante, I’m going to catch you up over the next few weeks. If you have any other favorite shops or suggestions, please leave a comment below!